The New Moon at 26+ degrees of Sagittarius on Dec. 18, 2017, was at the Galactic Centre and in conjunction with Saturn, centaur planet Pholus and trans-Neptunian object Quaoar. 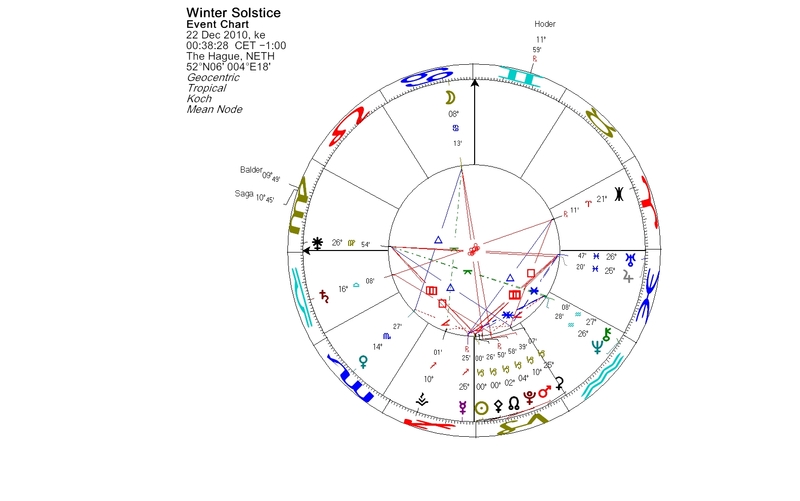 At Winter Solstice the Sun, Saturn and Quaoar are in exact conjunction in the first degree of Capricorn, one of the Cardinal Points, which tend to connect us to the larger world around us. Capricorn is ruled by Saturn, and Saturn entered its own sign yesterday. The Sun followed there today. Quaoar is a trans-Neptunian object with an orbital period of 284.5 years. Quaoar ingressed Capricorn two weeks ago. Quaoar is a quite large cubewano, possibly a dwarf planet, discovered in 2002 by Mike Brown and Chad Trujillo. At the time of its discovery it was the largest object found in our Solar System since the discovery of Pluto. Its orbit is nearly circular and moderately inclined. Quaoar has a moon, Weywot, discovered in 2007 by Mike Brown. Both names come from the mythology of the Native American Tongva tribe in Southern California, where the discovery of Quaoar was made. Quaoar was the creation god of the Tongva. Quaoar has no form or gender. He danced and sang the sky god Weywot into existence. Together they created everything else into existence: other gods, people, animals and plants. Saturn once represented the edge of our Solar System. Then the development of astronomical equipment allowed us to see Uranus, Neptune and Pluto. After the discovery of 1992 QB1, thousands of distant minor planets have been found. The Solar System as well as our understanding of it has broadened. Quaoar has a special meaning for me. 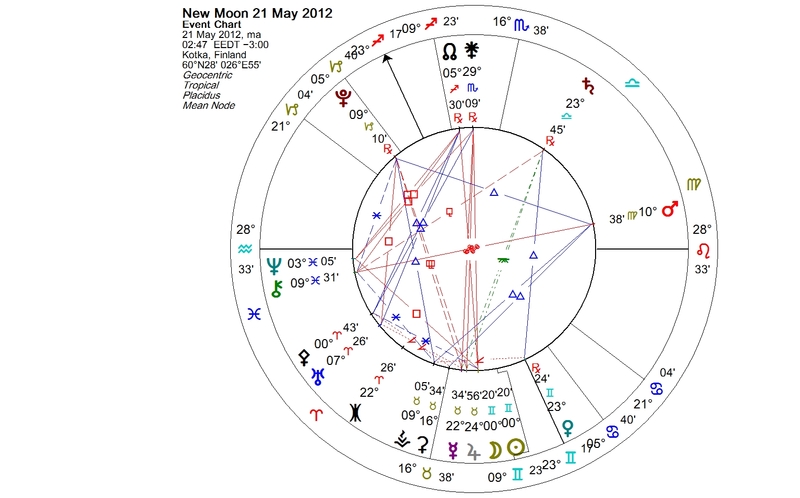 In 2002 when the discovery of Quaoar was announced, Quaoar was transiting my natal Moon and my lunar North node. It was the first trans-Neptunian object besides Pluto that I noticed, and which lead me to become aware of the centaurs and all the other intriguing worlds beyond Neptune. Quaoar danced the other small worlds and gods into my awareness. The Solstices and the Equinoxes govern the seasons. The Sun reaches its most northern position around June 21 each year. This is the day of the Summer Solstice in the Northern hemisphere, the longest day of the year. The Sun enters Cancer. The first degree of Cancer is one of the Cardinal Points. The other three of those points are the first degrees of Libra, Capricorn and Aries. 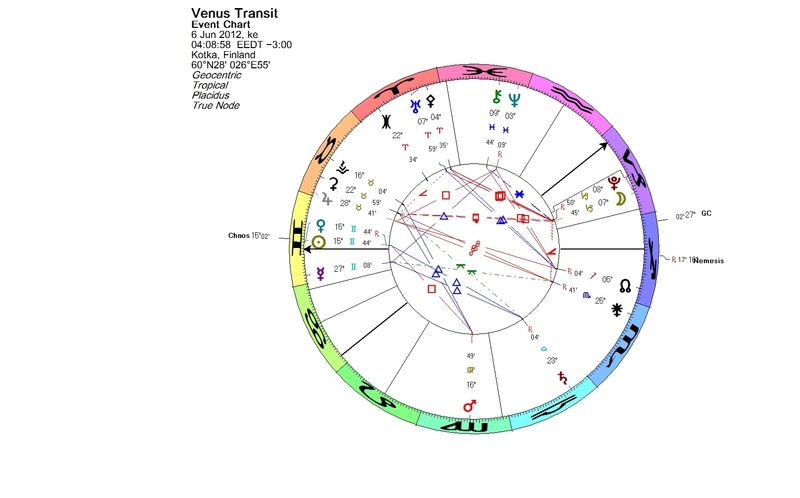 They are sensitive points in the chart, which tend to connect us to the larger world around us. Last summer in mid-June, a new little object came in to our consciousness, 2016 HO3. 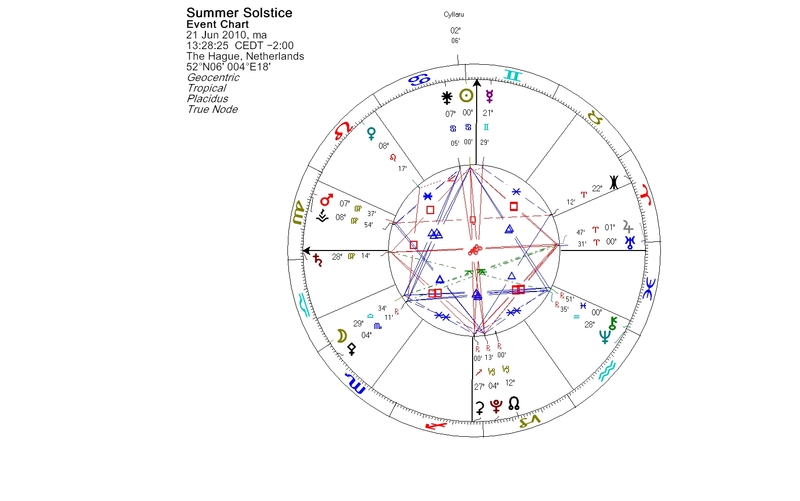 In the 2016 Summer Solstice chart it was occupying the first degree of Libra, in a perfect square to the Sun. It is exactly in the same position again. 2016 HO3 is our constant companion, circulating around us. It is not a real moon, but a quasi-satellite of Earth. It actually orbits the Sun, and at the same time is also looping around our planet. It has been a stable quasi-satellite of Earth for almost a century, and it will continue to be for about three hundred years more. 2016 HO3 spends about half of its time inside the Earth’s orbit, and about half of the time outside of it. I started to study the orbit of 2016 HO3 in the astrological chart and was astonished. 2016 HO3 resides mostly only in the signs of Virgo, Libra and Scorpio. Sometimes it may visit also Leo and Sagittarius, but it seems it has not been in Sagittarius since the 60’s. In Leo we are not going to see it until in 2026. First, let’s track the path of 2016 HO3 through the current year. The Capricorn Sun squared 2016 HO3 in the mid degrees of Libra around Jan. 5, 2017. 2016 HO3 was sliding outside the Earth’s orbit. In the beginning of March it started to retrograde in Scorpio. On April 5 it was in opposition to the Sun, still retrograding, again in the mid degrees of Libra, in the same position where it had been at the time of the square. 2016 HO3 visited Virgo, turned direct in May, and now at the Summer Solstice it has just ingressed Libra again. It is proceeding inside the orbit of the Earth. In August it will turn retrograde in the mid degrees of Libra. The conjunction of the Sun and 2016 HO3 happens in September at 24 degrees of Virgo while 2016 HO3 is still in retrograde motion. This same repeats every year, only the degree numbers gradually change. In 2019 at the Autumn Equinox the conjunction of the Sun and 2016 HO3 happens in the first degree of Libra. In 2021 and 2022 the opposition takes place around the Vernal Equinox while 2016 HO3 is in the beginning of Libra. Our tiny companion 2016 HO3 seems to have a relationship to the equinoxes and the solstices, and to the Cardinal Points. Its manifestation and abridged appearance in the signs may refer to a distinct message, which is essential to humanity during the next couple of centuries. 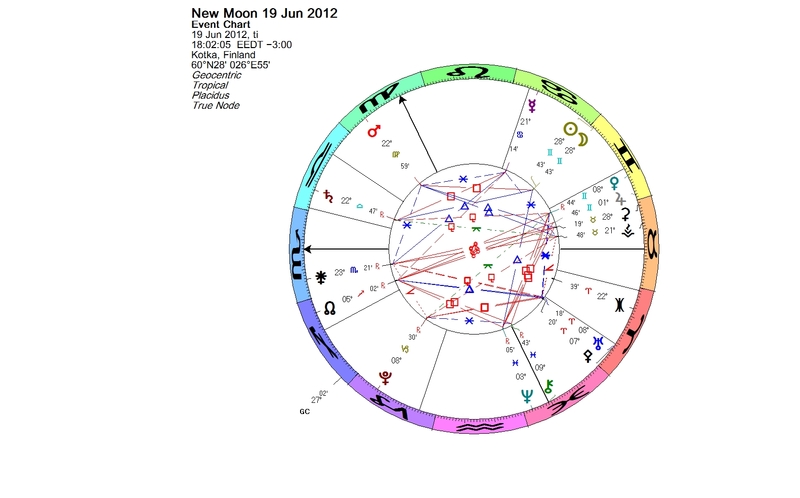 There has been a lot of activity lately at the borderline of Gemini and Cancer. Centaur planet Thereus in the last degree of Gemini has been coloring the events of the week. Thereus has an orbital period of 35 years, and the orbit lies near Saturn. Centaur Thereus in Greek mythology was a hunter, who captured bears and carried them home, alive and struggling. 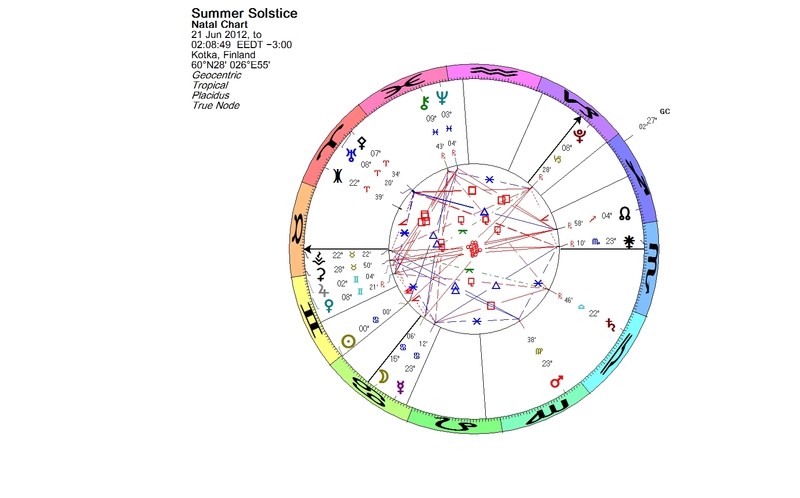 The Sun crossed Thereus on June 20, and entered Cancer the next day, on June 21, which was the longest day of the year in the northern hemisphere, the Summer Solstice. The Solstice was followed by a super Full Moon in Capricorn on June 23. It was the closest and largest Full Moon of the year. 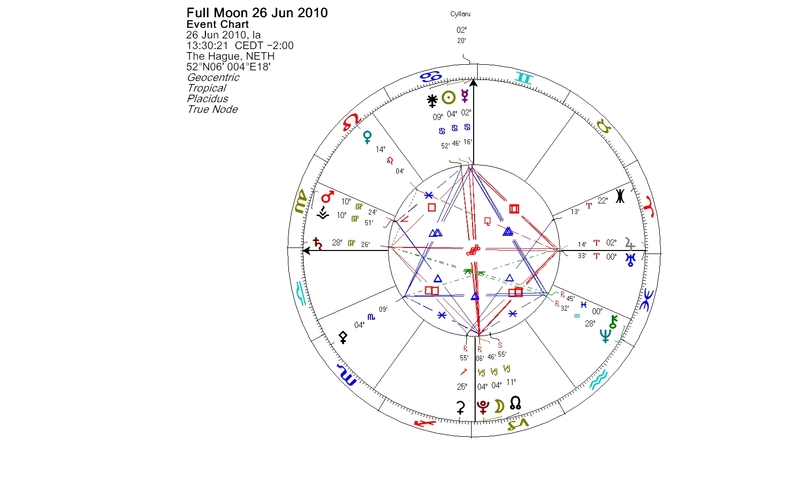 A Full Moon is always an opposition of the Sun and the Moon, and this time the alignment took place in the early degrees of Cancer and Capricorn, square the Aries Point. 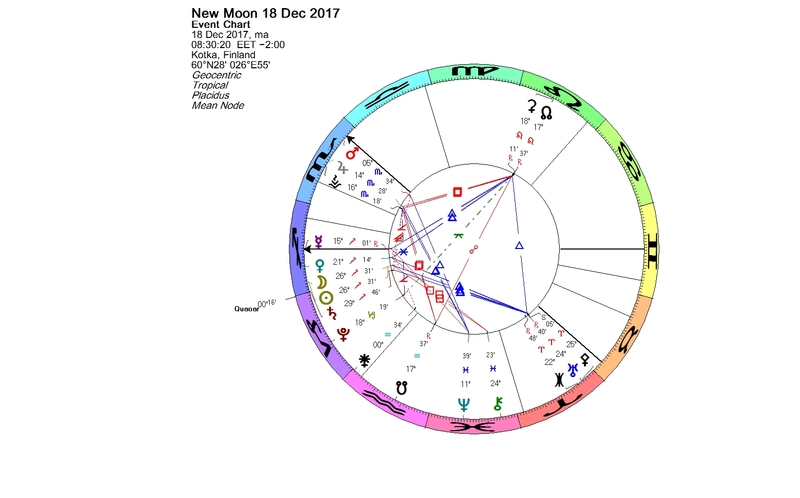 A couple of hours after the exact Full Moon alignment, Jupiter conjoined Thereus in the last degree of Gemini, in conjunction with the Cancer Sun. Thus Thereus was first lit by the Sun and then magnified by Jupiter’s touch. Like all Centaurs, Thereus has potential for healing and transformation. The Centaurs are related to the shadow, the dark and deep stuff in our psyche. There is no light without the shadow. The healing process is available for us, if only we have the courage to encounter any of our dark issues. It is a continuing process, in which we change and grow. Thereus speaks about this unfolding process. He used to carry snarling bears into his home cave. He didn’t do it only once or twice, it was a habit of his. On June 26 Jupiter ingressed Cancer, the sign which represents the home. Tomorrow, on June 29, Centaur Thereus follows the Sun and Jupiter to Cancer. 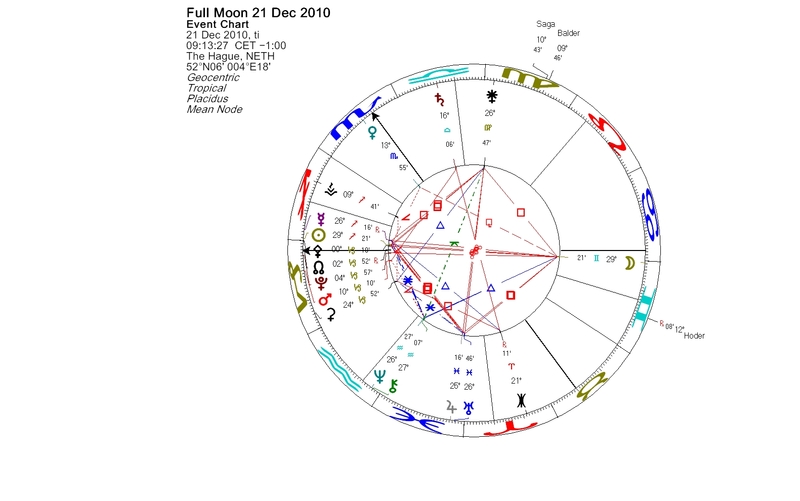 In February 2014, due the retrogradation, Thereus briefly revisits Gemini, and in March 2014 enters Cancer again for the second and last time on this round, staying there until July 2017. 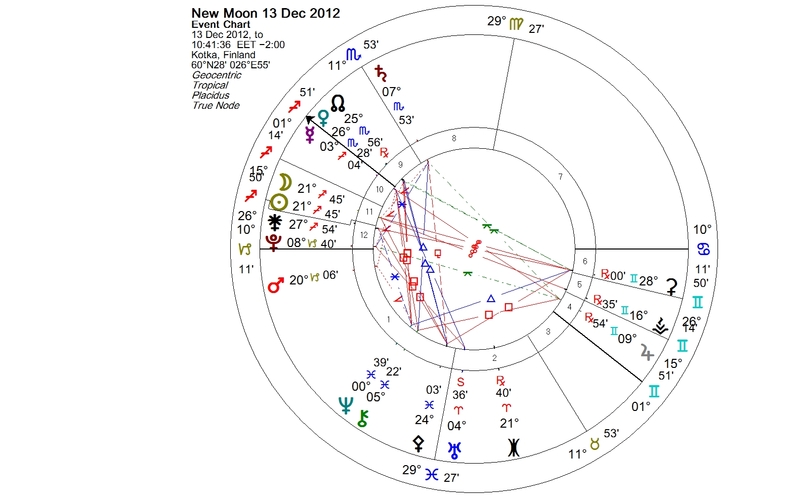 The Sagittarius New Moon was on Thursday. 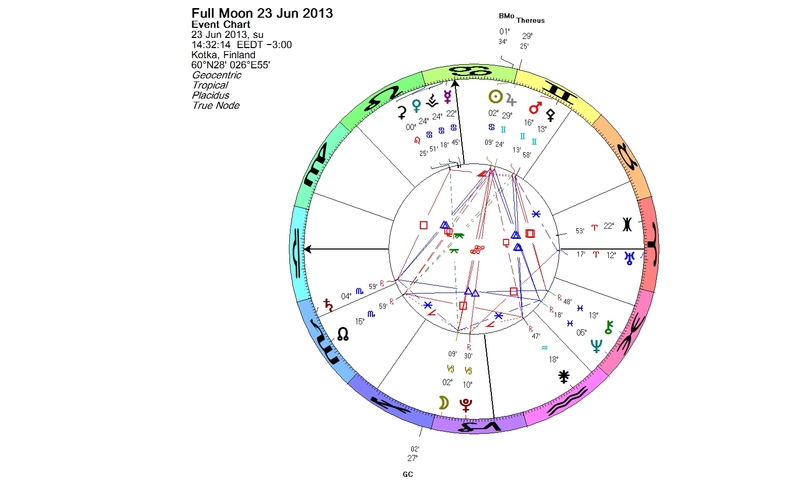 There is a prominent yod pattern in the chart, formed by Jupiter, Saturn and Pluto. Saturn is sextile to Pluto, and retrograding Jupiter is the apex of this yod, forming quincunx aspects (150 degrees) to both Saturn and Pluto. The ruler of Sagittarius, the current New Moon’s sign, is Jupiter, which forms the focal point of the yod. This yod will still be valid in the Winter Solstice chart on Dec. 21 and also in the Full Moon chart on Dec 28. Quincunxes may feel annoying and stressful. This feeling is perhaps signaling that everything is not as it should be. Bernadette Brady writes in Predictive Astrology, that “the quincunx wants to move you into a new situation whether you are ready for it or not. Sometimes this is very stressful; at other times it may be joyful.” To ease the stress, you could make some adjustments, and to be able to do the right kind of adjustments, you first need to understand your present situation and what needs to be changed. We humans seldom manage to do everything perfectly, but even small adjustments can make a difference. Striving for the goal may pay off now. Sagittarius is an adventurous, enthusiastic and future-oriented fire sign. Exploration and long-distance travel are connected to this sign. Faith, trust, joy and optimism are attributes commonly associated with it. Jupiter stands for expansion, growth, opportunity, support and faith. Saturn stands for grounding, structures, limits and fear. Jupiter and Saturn are called the social planets. They mediate between the so-called personal planets (the luminaries, Mercury, Venus and Mars) and the collective planets (Uranus, Neptune and Pluto), and connect our personal life to the wider world. Jupiter and Saturn represent opposite principles. We need both of them. Pluto is known as the planet of renewal, the great transformer. It operates deep in the shadows. Just as the physical planet Pluto cannot be seen without technical equipment, the matters it deals with tend to be hidden in our consciousness. So, the challenge of the moment is to make these energies represented in the yod work constructively for your goal, whatever that may be. The retrograde movement of Jupiter gives a clue that integrating something from the past might be beneficial for the task. When considering the nature of the quincunx aspect, it is worthwhile to determine if the aspect is approaching or departing. On which side of an opposition the quincunx takes place, matters. Jupiter, the faster moving planet, is moving towards the opposition to Pluto, away from the conjunction which has already taken place in the past. This is a departing quincunx, which corresponds to the sign Virgo and the sixth house. For a while, dedicate yourself to practical work, remember to take care of your health though, and pay attention to details. 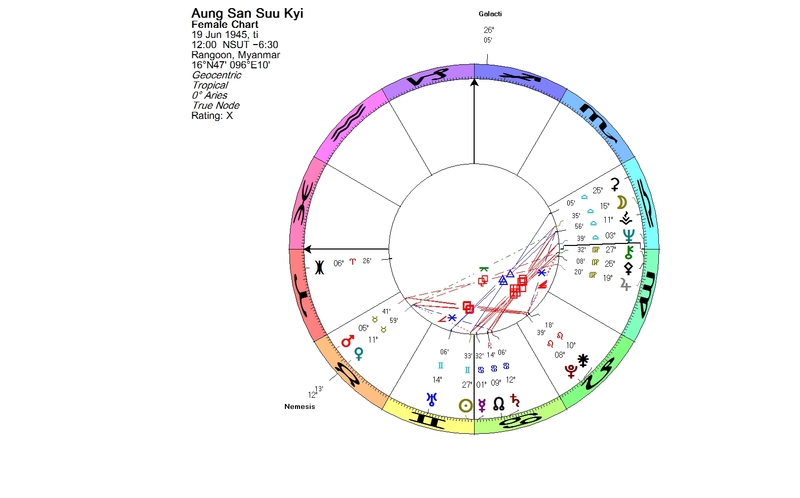 There is a strong Mercury connection, because Jupiter is now in Gemini, the other Mercury ruled sign besides Virgo. An apt image for this New Moon is Voyager 1 on the edge of our solar system heading to the stars, the news which was widely reported just recently. Voyager 1 is one of two space probes launched in 1977 to explore the outer planets in our solar system. On board is a recording of music and voices, greetings from Earth. A favorable alignment of the planets allowed the probes to reach the outer solar system by means of the new gravity assist technique. 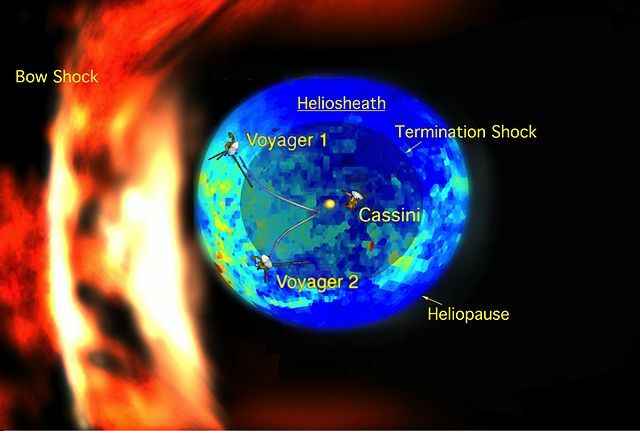 A slingshot maneuver around a planet was used to adjust the probe’s trajectory and speed relative to the Sun. Voyager 1 flew past Jupiter and Saturn, made new discoveries, and sent detailed pictures of the giants to us. When the primary mission was over and Voyager 1 was speeding out of the solar system, it was still operational, so the scientists gave it a new one, an interstellar mission. At the moment Voyager 1 is the farthest manmade object ever sent from Earth, still receiving commands and transmitting information to Earth. It is near a new breakthrough in the heliosheath, the last boundary before interstellar space. 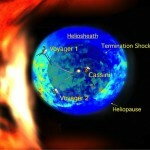 It has reached a “magnetic highway” where the Sun’s magnetic field connects to the magnetic field of interstellar space. Voyager 1 keeps moving forward in a region unlike anything any manmade machine has entered before, until it exits from our solar system. It has enough power to continue the adventure into the future and keep communicating with Earth until 2020, possibly longer. As my friend and editor Chad Townsend expressed it, the lesson of the quincunx is to adjust (Virgo) to where you end up and make the most of what you are given (acceptance). The news about the tragedy in Connecticut reached me while I was writing the blog. I would like to express my sincere condolences for the community of Newtown. The Sun reaches its most northern position around June 21 each year. This is the day of the summer solstice in the Northern hemisphere, the longest day of the year, and the shortest in the Southern hemisphere. The Sun enters Cancer. The first degree of Cancer is one of the Cardinal Points. They are sensitive points in the chart, which tend to connect us to big events of the world. 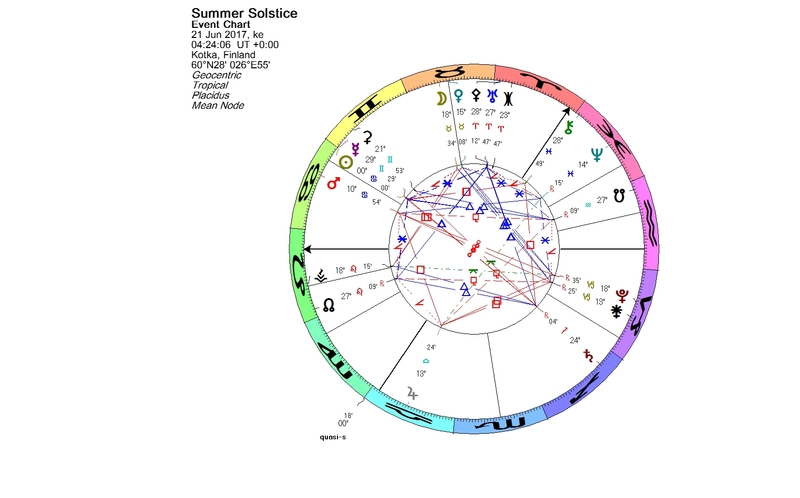 Solstice charts can give astrologers clues for the cosmic climate of the next few months. Solstices are also natural turning points in our personal lives. A solstice occurs twice each year, when the Sun reaches its northernmost or southernmost extreme. At these points the Sun appears to stand still. Astrology originated from astronomical observation. Our ancestors had a conscious relationship with solar and lunar cycles. They built enduring stone monuments related to astronomical alignments. Stonehenge in England is probably the most famous of the prehistoric monuments in the world. Stonehenge is said to be planned and deliberately oriented so that the summer solstice Sun rose directly over the so-called Heel Stone and the first rays shone into the center of the monument. However, there is evidence indicating that ancestors did not visit the site at all in the summer, but rather during the winter solstice. Current theories suggest that Stonehenge was simultaneously used for astronomical observation and for ritual function. Last month the Internet publication of Ursa Astronomical Association, Tähdet ja Avaruus, was reporting of the greatest archaeastronomical finding in Finland; the so-called Giant’s Churches were used for observing the Sun. The Giant’s Churches are Neolithic stone structures, unique to Ostrobothnia in the western Finland. A recent study by astronomer Marianna Ridderstad from University of Helsinki and archaeologist Jari Okkonen from University of Oulu shows that many of these mysterious constructions are found to have orientations to the risings and settings of the Sun on the main solar dates of the year. The Giant’s Churches were built 2500 – 2000 BCE, and there are about 40 of them. They were originally built on the seashore or on islands, but are now situated as far as 30 kilometers inland because of the post-glacial rebound. Their shape varies from oval to rectangular. The largest of them are 50 – 60 meters long. The walls are relatively low and they are usually constructed from rather small stones. Most of the structures have from two to four gates. It is not quite clear why the Giant’s Churches were built. Their function has been a matter of debate more than a hundred years. There are no signs of permanent inhabitation inside the structures. Probably they were used as ritual sites, and they may have had other functions, too. The study which was carried out in 2008 – 2009 and published in May, 2009, shows that their orientations may be significant in relation to important solar dates. The solar events considered in this study were the solstices, the equinoxes and the so-called Mid-Quarter Days. In Finland, the most important festivals coinciding with these events have traditionally been Vappu (St. Valborg’s Day) in May and Kekri, which was the ancient festival of the dead predating historical times, celebrated in November. The purpose of the Giant’s Churches is still partly unknown and further research on the sites will be carried out. You are currently browsing the archives for the Solstices category.